With Pesach coming soon, I'd like to take a look at a word that appears in the very beginning of the Haggadah. Before Ha Lachma Anya, even before kiddush - there is the phrase: מוזגים כוס ראשון mozgim kos rishon. Generally translated as "pour the first cup", this might seem like a simple instruction, and not worthy of much notice. And in fact, none of the many hagadot that I checked discussed the word mozeg מוזג at all. But as we often see here, there's more to it than meets the eye. Let's start by looking at the word mozeg. While it does mean "pour" in modern Hebrew, that wasn't the original meaning of the word. It appears in Biblical Hebrew once - in the noun form mezeg מזג, in Shir HaShirim 7:3. 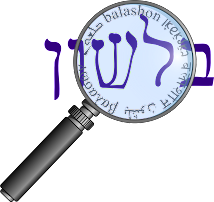 Its sister form, מסך, appears a number of times - both as a verb masach (Yishayahu 5:22, 19:14, Tehilim 102:10, Mishlei 9:2,5) and as the nouns mesek (Tehilim 75:9) and mimsak ממסך (Yishayahu 65:11, Mishlei 23:30). What does it mean? It means "to mix", specifically to mix wine. When Jerome must translate miscuit vinum, and the RSV "she has mixed her wine," we have an uncanny feeling that Latin and English are part of the same linguistic world as Hebrew. And there are those who do try to connect them. We've seen before that there seems to be a Greek connection to many of the words in Shir HaShirim, and Graetz thinks that mezeg might be a Greek borrowing as well. However, most scholars think that's not likely, and they don't even point to a possible earlier common root (as we saw with wine and yayin). There are those that actually connect מזג / מסך to the Egyptian mdg/mtk. R. Assi asked R. Yochanan: How is it when wine is mixed (masak) by a heathen? — He said to him: Use the verb mazag! [R. Assi] replied: I used the Scriptural word as in, "She has slain her sacrifice, she has mixed [masekah] her wine" (Mishlei 9:2). He said to him: The language of the Torah is distinct and so is the language of the Sages. We've skipped over an important question: Why was there a need to mix their wine at all? We see from Talmudic sources that wine was mixed with water, generally three parts water to one part wine (see Shabbat 77a, Niddah 19a). Since today we never mix wine with water, a common explanation is that the wine of that time was much stronger than the wine today. However, as a doctor friend of mine pointed out to me, there's a problem with that explanation. Before the discovery and spread of distillation, no wine could ever reach a higher alcohol content than 14%. (In research for this post, I learned that brandy is wine that has been distilled, and can reach 36-60% alcohol content, and port is wine that has been fortified by adding brandy - and has approximately 20% alcohol.) Diluting such a wine by 75% leaves a very low alcohol content. It's not likely that they were so sensitive to alcohol that they need such a weak wine. So what's the answer? Wine was almost invariably mixed with water before being drunk, and drinking undiluted wine, called merum, was either viewed as a provincial and barbarian habit, or, as a drink reserved for the gods. (The English word "mere" actually comes from the Latin word merum). The Romans usually mixed one part of wine to two parts of water, and hot water, or even seawater could be used. This contrasts somewhat with the Greeks, who also diluted their wine, but with three, or four, parts of water. According to Pliny, seawater was added to 'enliven the wine's smoothness'. Diluting wine in ancient times served two purposes: firstly, it turned it into a thirst-quenching drink that could be consumed in large quantities; and, secondly, the presence of alcohol made the water safer to drink, an important consideration in the growing cities of the Greek and Roman empires, where potable water was at a premium. We see that drinking straight water was discouraged in Jewish sources as well (Gittin 69b). This custom of diluting wine deserves our attention since the Greeks did not know the art of distillation and hence the alcoholic content of their wines could not have exceeded about fourteen percent, at which concentration the alcohol from natural fermentation becomes fatal to the fungus that produced it, thereby terminating the process. Simple evaporation without distillation could not increase the alcoholic content since alcohol, which has a lower boiling point than water, will merely escape to the air, leaving the final product weaker instead of more concentrated. Alcohol in fact was never isolated as the toxin in wine and there is no word for it in ancient Greek. Hence the dilution of wine, usually with at least three parts of water, could be expected to produce a drink of slight inebriating properties. That, however, was not the case. The word for drunkenness in Greek designates a state of raving madness. We hear of some wines so strong that they could be diluted with twenty parts of water and that required at least eight parts water to be drunk safely, for, according to report, the drinking of certain wines straight actually caused permanent brain damage and in some cases even death. Just three small cups of diluted wine were enough in fact to bring the drinker to the threshold of madness. Obviously the alcohol could not have been the cause of these extreme reactions. We can also document the fact that different wines were capable of inducing different physical symptoms, ranging from slumber to insomnia and hallucinations. The solution to this apparent contradiction is simply that ancient wine, like the wine of most early peoples, did not contain alcohol as its sole inebriant but was ordinarily a variable infusion of herbal toxins in a vinous liquid. Unguents, spices, and herbs, all with recognized psychotropic properties, could be added to the wine at the ceremony of its dilution with water. A description of such a ceremony occurs in Homer’s Odyssey, where Helen prepares a special wine by adding the euphoric nepenthes to the wine that she serves her husband and his guest. The fact is that the Greeks had devised a spectrum of ingredients for their drinks, each with its own properties. (One of the authors, Carl A. P. Ruck, discusses the issue in more detail in his book Sacred Mushrooms: Secrets of Eleusis , on pages 92-97). So it wasn't the alcohol that made the wine strong - it was the spices! And in fact, we see that "spices" were added to wine in a number of Hebrew sources. We see that almost all the mentions of mesek can be explained to be adding spices or other drugs to the wine (see for example Daat Mikra on Yishayahu 19:14, and Shadal on Yishayahu 5:22, who writes, "they would add spices סמים to wine in order to make it more intoxicating"). In Maccabees III 5:45 it says that the elephants were driven to madness before battle by giving them "wine mixed with frankincense". Kaddari mentions Mark 15:23 , where we see that myrrh was added to the wine as an anaesthetic (we've previously discussed how in Jewish sources wine was provided before an execution.) And there are similar sources in the Talmud as well (Maaser Sheni 2:1). Note that the Aramaic word for intoxication was besumei בסומי- from besamim בשמים, "spices"! We've mentioned before (for example in our discussion of afikoman) that the seder was modeled on the Greek symposium. However, the rabbis made sure that this special occasion did not denigrate into simple revelry or worse. So of course it was very important to mix the wine with water. In fact, there was an opinion in the Mishna that if one did not dilute the wine the blessing "borei pri hagafen" could not be made (Berachot 50b). And one of the descriptions of the "rebellious son" was that he drank neat wine - without dilution (Sanhedrin 70a). Certainly this would not be appropriate for the Seder night (see Pesachim 108b for a discussion of whether one fulfills the seder night obligation with undiluted wine). Of course as time went on, as Rashi and the Tosafot mention (on Pesachim 108b), there was no longer a need or a practice to dilute the wine. However, I do find it strange that nothing is done at the Seder to recall this once common custom. We saw that with mesubin and afikoman that the the meaning and practice of the words have changed significantly over the generations. But we still do eat the afikoman and lean on our side - even if that wasn't the original intent. What is left of the mixing of wine? Maybe, if only to get the children to ask questions - we should be inspired by Shir HaShirim, and not leave out the "mezeg" -אַל-יֶחְסַר הַמָּזֶג al yechsar hamazeg!